Comments Off on Five Points Festival returns with a new home in Brooklyn NY! 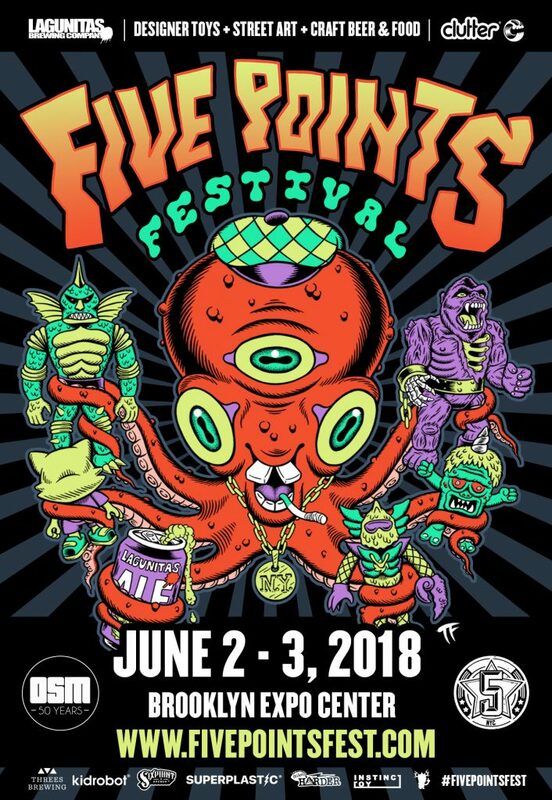 New York, NY (April 19, 2018) – Five Points Festival, a designer toy, street, and alternative art festival is excited to announce the return of the much-anticipated event for 2018! Taking place the weekend of June 2-3rd, 2018 – at the awesome Brooklyn Expo Center, the festival will bring together the shining stars of the Designer Toy, Kaiju & Sofubi, Craft Beer, Food and alternative art worlds. Roll like a P.I.M.P – Get a VIP ticket for Five Points Fest 2018, Designer Toy Awards & Early Access and MORE! DTA Ticket – Party with us at the Designer Toy Awards and rub elbows with the best in the industry! – THE ONLY WAY TO GET A TICKET! Exclusive Toy – Mini Erosion Molly by Kenny Wong and Instinctoy from Japan. Official event poster is below. Designed by amazing West Coast poster and tattoo artist, Thomas Fernandez (https://www.instagram.com/liveradstudios/ ).